Show us a shot of the deck and joint area so that we can have a think. Bright red, could be a fire tender ! On thinking about this, it doesn't actually want to go along the join but perhaps half an inch below it. I just like the idea of a "bumper" of some kind running round the hull apart from across the front, rather than sticking tyres on. I suppose I could do it with wooden strips and just touch those up as required rather than the hull sides, but now I'd have to stick those onto the paint! Ref the red, the idea is that it'll be black above the waterline, but TBH I'm a bit worried about the masking. I've got some Tamiya tape, but I've never used it with brushed Humbrol before so I have absolutely no idea how long to leave it before peeling back. A positive attitude may not solve all your problems, but with any luck it will annoy enough people to make the effort worthwhile. I used an old toothed timing belt. Garages throw them in the skip. Neat idea, Ned What's that on the wossnames at the front - on the actual pusher thingies? to damage any boat you are rescuing. Woo hoo! I just discovered this stuff, so I'll trot off to the nearest garage if it ever stops raining and see what I can scrounge! Thanks for the inspiration, Ned. And thanks for that Dave. Square sponge type sealing strip from B&Q works for bumper ( push-knees is correct term, USA). Extend your choice of rubber down to waterline. Careful with lead casting, can you not find a half brick or something ready-made ? Two gel-cells for instance ? ... Careful with lead casting, can you not find a half brick or something ready-made ? Two gel-cells for instance ? Gel cells = lead acid battery with a gel instead of a liquid acid, non spill. Use those to power the vessel means working ballast instead of dead weight. Go have a word with your local alarm installation company, often get usable gel cells for peanuts as they have to be replaced over time. Don't beat yourself up over it, we all have senior moments.....worse still it could be a senior blonde moment, then you're really up the brown coloured creek paddle-less! 6V 4.5 AH gel cells. plus plenty of run time. Being gel cells they can be laid flat. Run in parallel you have six volts. Run in series you have twelve volts. Very little extra ballast is needed. attitude as the beasties try to bury the bow. Ned, this first one's using a 4Ah 7.2 LiPo for a variety of reasons, but if finances permit I'll certainly be using lead-acid for the next one. There's the best part of 6lb of church roof in this one! Pop along to your nearest Wheelchair/Mobility Scooter repair Shop and they may have some Free! batteries as they change them often at services. Len a care worker who knows, never short of batteries. this whole thing's a tryout, and similarly no point in anything other than a very basic topsides. Front and back bumpers are rubber from some weird cheapo exercise gadget I pulled out of a skip, with that rubber car door seal stuff I linked to in an earlier post on the pushers. Congratulations Norman, that is a brilliant first build. The first of many I hope. Those fenders look the part, very tidy and as if designed for the job. Well done. 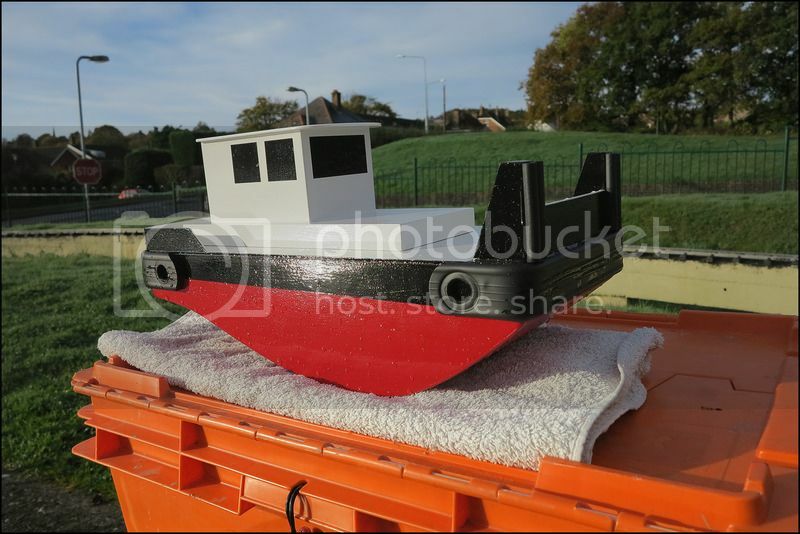 That is you hooked In the spirit of the adaptable Springer you could reverse the top and add a vintage steam tug style funnel and have a different vessel with wheelhouse in front and funnel behind, maybe a dowel mast and a few geegaws ,ladders, vents, portholes etc. We need a picture of the bike and trailer I might copy that idea. looks like a crate from wilkinsons, or asda, or tesco, usually for carrying CD's etc, stackable, hinged lid. Cheers chaps. The top's as it is simply because of the height limitation inside the crate, which is actually an old Rentacrate as used for office removals. That's semi-permanently mounted on the larger of the two sizes of Carry Freedom trailer, which gets towed behind a three year old Kalkhoff Agattu pedelec. It's too hilly round here to use the trailer with my normal bike! Hi Norman video comes up as a private one so couldn't see it, but well done on your first build, I enjoy sailing mine they are a lot of fun and also have a practical side. Ooops. Never done this before but I think I've sorted that now. Can somebody please check it?